A majestic film inspired by the true story of youth seeking Olympic glory, Chariots Of Fire captures the single-minded determination required to grasp gold. The stories of Scotsman Eric Liddell and Englishman Harold Abrahams are entry points to a journey celebrating the athletic spirit as it strives for the ultimate goal. Abrahams (Ben Cross) joins Cambridge University in 1919. A Jew who senses an undercurrent of prejudice wherever he goes, Abrahams carries an intense desire to prove himself and runs for personal glory. He makes friends with other athletes at Cambridge, including Lord Lindsay (Nigel Havers) and starts a relationship with opera singer Sybil Gordon (Alice Krige), before seeking the next level of performance by hiring legendary professional trainer Sam Mussabini (Ian Holm). His abandonment of the pure amateur ethic earns the wrath of the Cambridge Deans (John Gielgud and Lindsay Anderson). Meanwhile, Eric Liddell (Ian Charleson) turns his attention from the Scottish national rugby team to competitive running. A devoutly religious man from a family of missionaries, Liddell believes that his incredible running abilities are a gift from God. This sets him on a collision course with his sister Jennie (Cheryl Campbell), who resents Eric spending time training and away from his religious calling. Both Abrahams and Liddell qualify for Great Britain's team sent to contest the 1924 Olympic Games in Paris. To earn their victories, they will have to overcome self-doubt and the strong American track team led by Charlie Paddock (Dennis Christopher) and Jackson Scholz (Brad Davis). Director Hugh Hudson allows his cameras to soak in the lush locations depicting Cambridge (actually filmed at Eton College), the Scottish countryside, and Paris (filmed at the Oval in Merseyside). 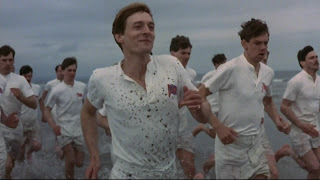 Chariots Of Fire is a period piece not afraid to breathe the fresh air by placing many scenes outdoors. Most famously, Hudson starts and ends the movie with the Great Britain team, including Abrahams and Liddell, on a beach training run filmed at St. Andrews, set to the magical music of Vangelis. Hudson took a significant risk in his decision to use a modern synthesizer-driven soundtrack for events set in the 1920s, and the gamble paid off handsomely. The mixing of the old and the new allowed the story of athletes from a bygone era to span the generations and resonate with a modern audience, confirming the timeless appeal of the quest for sports glory. The decision to cast relative unknowns in the lead roles also proved to be a success, with Ben Cross and Ian Charleson masterful as Abrahams and Liddell. The lack of star power removes distractions and re-emphasizes the amateur milieu. Veterans Gielgud and Holm add heft to the supporting roles. Chariots Of Fire is perfectly paced, the competition scenes injecting regular punctuation marks to the more stately character-building interludes, and Hudson uses era-appropriate newspaper headlines to invoke the impact that the exploits of Abrahams and Liddell were having on society at large. Traveling on different paths, and striving for different objectives, Abrahams and Liddell arrived at their moments of truth. As is often the case, the journey and motivations are more fascinating than the outcomes. 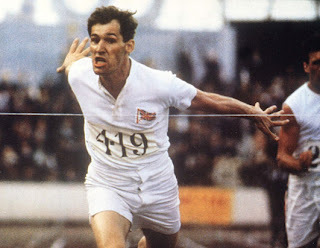 Chariots Of Fire is a remarkable combination of grand spectacle and touching humanity.